Volvo Ocean Race – Could Ghana Ocean Racing be sailing’s Cool Runnings? We had been hearing whispers on the grapevine recently about a possible Ghana based campaign for the next Volvo Ocean Race. While we thought the prospect sounded pretty unlikely, it turned out the rumours were true. Earlier this week we managed to track down Agbeli Ameko from Ghana Ocean Racing and we asked him about his audacious plans to found the first African ocean racing crew. “The basic vision is to put together Team Ghana Ocean Racing – the first ever African team to enter the Volvo Ocean Race.” he told us from Alicante where he and his business partner Eyram Hevi (a.k.a. Ziggy) had been meeting with race organisers. When Ameko and Ziggy worked together at a mineral company in Africa on sustainable development and mineral exploration projects they came up with the idea of the idea of an African sailing team. Now they are working full time on making their dream a reality. “The first order of business was the mundane stuff like registering businesses and going to the Ghana government and the sports ministry to get approval to set up a formal non-profit organisation,” Ameko said. “We also have an MD in James Darden who put together the US based foundation Take Back Our Routes. Ameko said getting buy in from the Ghana government and the sports authority had been a big boost to the credibility of the project. “The government is extremely excited about what we are doing and see this as an opportunity to project Ghana’s brand globally. While we have been in Spain we met with the embassy in Madrid and James is meeting with the ones in New York and DC to discuss potential collaboration. 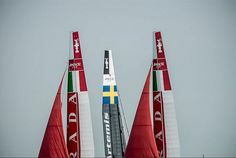 Now the pair say they have switched their attention to fund raising – a process they kicked off with an initial conversation with the Volvo Ocean Race organisers. “It wasn’t until the end of last year that we started the fund raising effort by targetting private donors,” Ameko explained. “We also started really pushing hard on corporate sponsors and putting presentations and documentation together. Ameko told us the response from the Volvo Ocean Race HQ had been encouraging. If charisma, boundless enthusiasm and boyish charm translated directly into sponsorship dollars then Ghana Ocean Racing would undoubtedly be fully funded and on their way to the start line of the next Volvo Ocean Race in 2014. But, it was time to ask them about the huge elephant in the room. That being, were either of them sailors? In fact, does Ghana even have any experienced ocean racers? “No.” Agbeli answers without hesitation or a waiver in his smile. “We ourselves are are not sailors and more to the point there is nobody in Ghana who is experienced right now. But we are adventurers. We asked Ameko to sum up the value proposition for Ghana Ocean Racing and to give us some indication how close they were to getting the funding they needed. “We are coming at this as kind of outsiders,” he admitted. “I look at the Whitbread Race tradition of how they put together those early campaigns with a bunch of people who wanted to sail around the world and just went off and did it. “I recognise that the game has changed dramatically but I hope there is still room for some of that spirit. “What we want are sponsors who emotionally connect with the passion and excitement that we have, along with the genuine novelty of an African sailing team. That’s really the challenge – packaging that and getting companies to recognise that opportunity. “People have made comparisons with the Jamaican bobsleigh team in the movie Cool Runnings. It’s a little like that, in that Ghana has a strong historical link with the ocean but no experience in ocean racing. Agbeli and Ziggy believe that a Ghana entry could help expose the Volvo Ocean Race and the sport of sailing to a new audience. “We think a Ghana team could have a big impact on the Volvo Ocean Race and the sport,” the told us. “In the same way as in golf when Tiger Woods came in and expanded the demographic and the interest. So, a Ghana team in the Volvo Ocean Race? Well, based on Agbeli and Ziggy’s work rate, dedication and general irrepressible charm, we certainly wouldn’t bet against it happening one day. If and when it does, just remember you heard it here first. A longer version of this interview will appear in the March edition of the Sail Racing Magazine iPad and tablet edition – out soon. The post Volvo Ocean Race – Could Ghana Ocean Racing be sailing’s Cool Runnings? appeared first on Sail Racing Magazine.